The intensely porky Cajun sausage called boudin inspires a Louisiana road trip that starts at a restaurant in New Orleans and ends at a roadhouse in Breaux Bridge. Only in food-obsessed Louisiana would the favorite cheer of the favorite college football team reference epicurean delicacies. Well, perhaps "delicacies" is a stretch. Boudin (a pork and rice sausage) and couche-couche (a kind of fried cornmeal mush) are staples of a Cajun cuisine that thrives in a relatively small area of southern Louisiana and influences menus and food intelligence around the country. It is bold, rough, working-man’s food, with French, German, Spanish, Italian, African and West Indian influences, created from the area’s abundance of seafood, game, herbs and vegetables. It is a hard cuisine for outsiders to love and understand. But occasionally, a particularly talented local chef, like Paul Prudhomme, will move to a bigger stage in a prominent city and rekindle a national interest in what may be our best and most unique native food. Following Prudhomme’s example, Donald Link is off to a great start at establishing himself as America’s best new Cajun chef. Link is chef and owner of two of New Orleans’s best restaurants: Herbsaint, a seven-year-old Southern bistro in the downtown area, and the dazzling new Cochon, a sophisticated, country-casual spot in the Warehouse District that is drawing SRO crowds of food-smart locals and tourists. Cochon is refreshingly different. It is decidedly Cajun in a city that cherishes its Creole roots; it is surprisingly inexpensive for its level of quality; and, most significant, its menu is filled with beautifully executed and clever reinterpretations of the food Link grew up with in southwestern Louisiana. Cochon is not for those with timid palates or a lack of culinary curiosity. Here are some dishes on offer: hog’s head cheese; fried alligator; ham hocks with grits and peppers; fried boudin with pickled peppers; shrimp and deviled-egg gumbo; pork belly with potatoes, carrots and lima beans. Courage is rewarded at Cochon, as this is exuberantly good food. My brother Robert and I, and our wives, Francie and Darlene, all grew up in Louisiana. Rob and Francie never left. We have spent much of our lives eating less polished versions of Link’s food, and we weren’t scared off. We were fascinated by the quality of it, and by the very smart riffs on dishes we thought we knew. So we spent a week eating at Cochon and Herbsaint and then tracing the roots of the food back to Cajun country, trying to get inside Donald Link’s head. Link grew up in Lake Charles, just west of Cajun country. His ancestors were Links and Zaunbrechers, among the Germans who settled the prairie that runs along the western edge of Cajun country. He was a restless kid who worked in restaurants from the time he was 15. He studied finance at Louisiana State University but quit after five years "to drink beer and play golf," he says, an endeavor funded by working in the kitchen at Sammy’s in Baton Rouge, a local hangout of some note. Wanderlust took Link to San Francisco and several funky restaurants, including the Elite Cafe, where he was asked to introduce his Cajun food to the menu. After a bit he went back to Louisiana to cook with Susan Spicer at Bayona in New Orleans, then back to San Francisco to help Traci Des Jardins launch Jardiènere. In 2000, he again went "home," this time working with Spicer to open Herbsaint. On our first day at Cochon, we are given a tour of the kitchen by Link and his partner and co-chef, Stephen Stryjewski. It is a small, busy space in which practically every square foot is employed. There is barely room for the 150-pound (dressed and cleaned) pig that has just arrived. In true Cajun style, virtually every morsel will be used in some dish on the menu, hence the name Cochon (French for "pig"). Over the next few days, we smile as we see parts of our porcine friend show up on the plate. Link loves boudin, but he serves only a less challenging version. He says he is afraid some tourist will eat the sausage casing and choke to death, inspiring a headline in the local paper, to wit: "Tourist Chokes to Death on Link Sausage." So, only boudin balls are on the menu. These are the inside of the sausage shaped into balls, rolled in flour, dipped in buttermilk, covered in bread crumbs and fried. Most of the diners at Cochon don’t have a clue what they are eating, but it is hard to deny the looks of pleasure as they try to figure it out. I grew up with hog’s head cheese. My Uncle Leland (rest his soul) made it and served it with saltines. It was a fiery, gelatinous mess, and it scared the hell out of me. The name alone retarded my willingness to experiment with food, and I have seldom seen hog’s head cheese since. But it was on the Cochon menu, and how can you not order something with a name like that? Wanna know what’s in it? Pig snout and pig parts, mostly. They’re boiled down until everything falls apart. Then the meat is picked out. The bones and sinew and skin are discarded, the broth is cooked down with spices and green onions, and the meat is added back in. Then it chills and sets. This is a dish that doesn’t exactly grace a plate, so it’s nice to have a garnish. Link’s version has a secret ingre­dient that gives the cheese a distinctive tang. I silently apologize to Uncle Leland for failing to appreciate his artistry and say to Link, "You put vinegar in it, didn’t you?" He just gives me an enigmatic smile. Over two days we eat all his pork dishes, and we are bigger and better people for it. We love the ham hocks and pork shoulder, but not the grilled ribs. There’s rabbit on the menu, too. 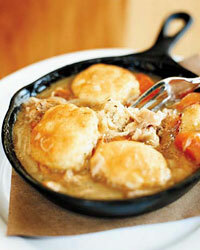 I think the rabbit stew with German dumplings is inspired, but Darlene has visions of the Easter Bunny and disagrees. What does she know? Fully half the menu is seafood—oysters, shrimp, crab, catfish, crawfish, alligator and saltwater fish taken from the marshes, swamps, lakes, rivers and farms that run through and around the remarkable Cajun countryside. At Cochon, Link makes brilliant use of this largesse. His oyster roast, for instance, is an appetizer of perfectly fresh oysters drizzled with a sauce of lemon butter, garlic and chile and then barely warmed through in the wood-burning oven. The taste of the sea with a hint of smoke is exhilarating. Over a long dinner, preceded by a tasting to make sure none of the bour­bons on the list have spoiled, I get Link to talk about the restaurants that have most influenced his thinking. He doesn’t have to try hard to name six establishments, taking care to emphasize that they are not accomplished restaurants, but places from which he’d learned something important. The next day, after a generous infusion of aspirin and a mannerly and delightful lunch at Herbsaint, we set off with Link’s list on what we call "the beer, bourbon and boudin tour." Boudin is a loose rice sausage made most often with pork, pig liver, onions and spices. The mixture is extruded into casings, tied off into links and kept in steam pots in gas stations, meat markets, general stores and roadside stands all over Cajun country. For some people, like me, eating boudin comes naturally. I simply cut a link apart, put the open end into my mouth and bite down gently while pulling. A delicious surprise is deposited on my tongue. Some use another perfectly acceptable method. They hold the open end of the link in their mouth and use the thumb and forefinger to squeeze the good stuff out. One often sees, but seldom respects, foreigners who extrude the contents onto a plate and take delicate little bites with a fork. Ain’t nothing delicate about boudin. It is said that Cajuns will eat anything that runs, walks, swims, crawls or slithers, and they serve it all with rice. My brother tells the story of a Cajun named Boudreaux who is awakened by his wife in the middle of the night. She tells him something like a flying saucer has landed on the levee behind the house and little green men are getting out of it. Boudreaux looks out and says, "I don’t know what that is, no, but I’ll take care of ’dis. Hand me my shotgun, you, and cook some rice." One other caution about boudin: This stuff looks scary. It is long and plump and slightly translucent and deathly gray. Think entrails, the large animal kind. Boudin for breakfast is bracing. We start at Poche’s Market and Restaurant in Breaux Bridge at 10 a.m. I’ve bought boudin from them by mail, and I know it’s good. But at that hour of the morning, it makes my companions queasy. We persist and are rewarded. The stuff is ridiculously good. Deeply porky and richly creamy with liver, it bites the tip of your tongue and the back of your throat with just enough spice to wake you up. Francie, a skeptic, eats about a pound-and-a-half. As we head out, one of the delightful young women behind the counter spots us as enthusiastic eaters and suggests we stick around for the cow-tongue cook-off that weekend. We pass. After visiting a few other boudin places recommended by locals, we drive to the place Link most wanted us to visit: Mowata (pronounced MO-wata) Store. It’s in Mowata, Louisiana, near the community of Link (yes, Link), between Crowley and Eunice, but not on any map known to humankind. You just have to drive by and look for it. The place does a steady business selling boudin and cracklings. We sit at one of the two tables and order some of both. Damn, they’re good. The boudin has an intense, swiney flavor with a slight whiff of chitlins and an aggressive spice. It’s the spiciest we will taste, but it’s missing the unctuous richness of liver. Two of us like it more for that reason, two less. But, hey, let’s not quibble. This is inspired food. I am pretty sure Link’s lesson here is about boudin as a symbol. It is about Cajun simplicity and frugality and creativity. As Poche’s motto suggests, they cook "everything from the rooter to the tooter." The motto is also about pride and the commitment to excellence displayed by these people, who try every day to make at least one thing better than anyone else in the world—in this case, boudin. That night, we are genuinely excited as we head to one of the best-known places on Link’s list, Pat’s Fisherman’s Wharf. Pat’s sits between Bayou Amy (pronounced ah-ME) and the levee that holds back Henderson Lake, a body of water formed by the Atchaf­alaya River basin, a vast flood plain that spawns one of the most impenetrable networks of swamps in the world. It is also the source of the best crawfish and catfish in America, a lot of which is processed near Pat’s. You can imagine the catfish and crawfish and alligators swimming up to Pat’s back door to surrender. Pat’s looks perfect. The food is incredibly bad, but we order a lot. Some is cold, some is greasy, some is just badly conceived. I want to call Link and threaten to knock a wart on his head for inflicting this place on us. We spend the whole drive back to our $49-a-night motel, through ominous rain and lightning, arguing about what he was saying by directing us there. Francie suggests he was trying to show how good Cochon is by contrast. I wake up during the night and realize what Link had learned from Pat’s: "You can’t quit trying." The next night is so good, it almost makes up for the previous one. We go to Hawk’s in the town of Rayne. Hawk’s is a big corrugated-tin shed plopped down right in the woods. It’s open only a few months a year, when crawfish are in season. I’m pretty sure Hawk’s makes boiled crawfish better than anyplace in the world. It starts by purging the crawfish, leaving them in running spring water for about 24 hours until the intestines are cleaned out. Hawk’s says the fat changes color during the process, and tastes better. We start with five pounds of crawfish—big ones. A couple of these would scare the hell out of a wimpy lobster. But size is not the secret to Hawk’s. Its success is all about absolutely fresh crawfish, boiled until the moment of perfect doneness (my guess is five to seven minutes). Then they are sprayed with spice, hot or regular. These crawfish almost "ping" with freshness when you bite into them—the texture is that flawless—and the taste is sweet and spicy. Five pounds isn’t enough. On the day we visit Hawk’s for dinner we also have a wonderful lunch at Frey’s Crawfish House in Welsh. It’s not much to look at, but it feels good when you walk in the door. Link thinks the owners of Frey’s, the Zaun­brechers, may be distantly related to him, but apparently they don’t know him and aren’t too impressed with the idea of a New Orleans chef, anyway. We order two gumbos, two bisques and two étouffées, this being a light lunch before we go to Hawk’s for dinner. The shrimp and corn bisque turns out to be one of our favorite dishes of the entire Cajun-country trip, and the gumbo rivals the one at Herbsaint as the best we taste. The crawfish étouffée is so infused with flavor, I think it is made with some kind of crawfish espresso. I’m not far off. Shonda Zaunbrecher, the chef at Hawk’s, tells us the secret is undercooking the crawfish so that the fat becomes runny and can be poured into the étouffée. She convinces us to try dessert. We say, "OK, but just a bite." Then daughter Angelica brings us a bread pudding topped with a whiskey sauce that is, hands down, the most delicious I have ever tasted. We eat every last crumb of it. And nap that afternoon. The best is saved for last. those who think Disneyland is the happiest place on earth have never been to Café Des Amis in Breaux Bridge. At 7:30 on a Saturday morning. We arrive at 6:50 for a table at the zydeco breakfast. By 7:30, when the door opens, people fill most of the block. The room is soon buzzing. We meet travelers from Rhode Island and France and Australia, but most of the customers have Cajun accents that indicate they are locals. We order great beignets and a huge bowl of couche-couche and omelets with tasso (a Cajun ham), plus grits and pork sausage, and, of course, Francie and I get eggs and boudin. We wash it down with rich café au lait and serious Bloody Marys and mimosas and wonder how we got so lucky. While we are waiting for the music to start, we talk about Link and the amazing job he has done taking lessons from his family and neighbors in Cajun country and reinventing some of the best for use in his New Orleans restaurants. And we know that he has sent us here to emphasize the connection between food and fun and music and life that is a hallmark of the Cajun spirit. At 8:30 sharp the music starts. People start dancing with "those who brung ’em," but soon, a natural selection takes place. The best dancers find the best dancers, and they fill up the floor, plus the spaces between the tables, and then the dancing extends out into the street. They dance—men and women, adults and children, women and women, men and men, black and white—and it is a rare moment of absolutely perfect joy. As we leave Breaux Bridge at about 10:30, sated from our breakfast, we see a sign that says, POCHE’S, ONE MILE. Rob and I look at each other at exactly the same moment, and Rob says, "What the hell, it’s only a mile." Thomas O. Ryder, a longtime magazine publisher, lives in Connecticut and eats with enthusiasm.